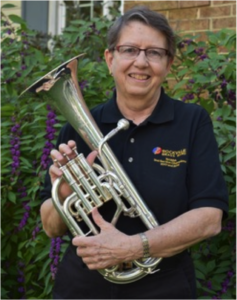 Ellen Jay, a tenor horn player, joined the Rockville Brass Band in 1993 devoting significant time to band operations and board governess serving on the Management Committee in 2013 charged with creating a new board format. Ellen served as president of the new board for two years followed by a term as vice president. Ellen grew up in Connecticut playing French horn in her school band as well as All-State ensembles, the regional youth symphony, and other community groups. Ellen studied with Abe Kniaz and Philip Farkas while attending Indiana University, completing requirements for a B.S. and M.S. in Elementary Education with additional certification in Library Science. Ellen chose to play with the university’s field hockey, basketball, and softball teams rather than participating in major musical performing ensembles, due to conflicting practice times. After working as an elementary school librarian for Montgomery County Public Schools for nine years, in 1987, Ellen took a leave of absence, accepting a graduate assistanceship to complete a PhD in Curriculum and Instruction from Kent State University. While at Kent State, Ellen studied horn with Dave Kimball playing in the orchestra, wind ensemble, and horn ensemble. Returning to Montgomery County Public Schools, Ellen continued teaching at the elementary level while also serving as adjunct professor in Library Science at The Catholic University and University of Maryland. During her career she authored a dozen books and participated in state and national professional associations being elected to American Library Association Council and President of the American Association of School Librarians. Upon retirement from MCPS in 2001 Ellen was appointed Interim Director of the School Library Media Department, responsible for administering 200+ school libraries for MCPS. Ellen finished her professional career as a curriculum consultant for MCPS School Library Media Programs and the Maryland State Department of Education Library Media program. In retirement Ellen enjoys following her passions of traveling, water gardening, dog sitting, and of course horn playing.